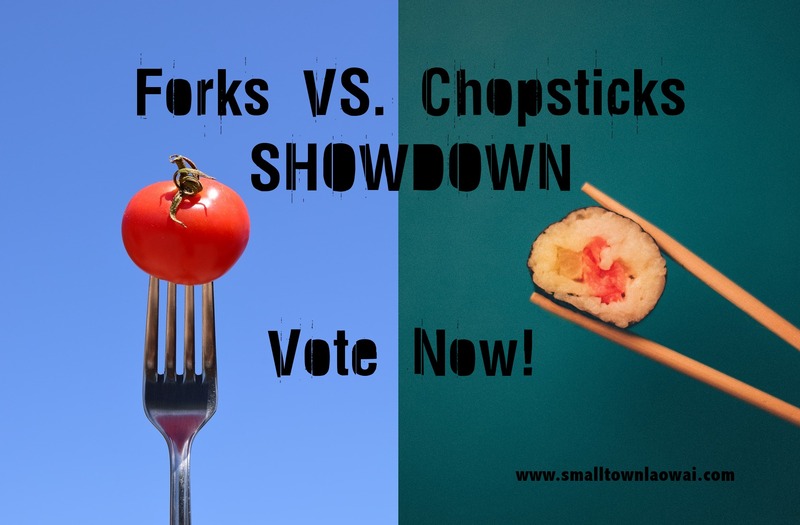 It’s time to announce the winner of the Fork vs. Chopsticks SHOWDOWN! Honestly, I thought these two utensils would be evenly matched, and we’d be seeing a very close race. However, it quickly became clear that one of them was winning by a country mile. Let’s look at the results from each battle. Pieces of lettuce can be slippery little guys. What’s your preferred method for getting them off the plate and into your mouth? Personally, I find it a hundred times easier to eat salad with a pair of chopsticks even if it makes me feel very “fusion,” but I’m in the minority. Fork was the clear winner for this category. Spoon is the Queen of Stirring Hot Drinks, but if all your spoons are dirty, do you reach for a fork or a chopstick as the next best thing? Chopsticks won this one by a wide margin. I’m curious to know if the results would be the same if we broke down “stirring milk into brewed coffee” and “stirring powdered stuff into hot water.” Because in my experience, chopsticks are great at the former but pretty bad at the latter. If you’re frying tofu, chicken, or anything else that needs to be turned partway through, would you rather use a fork or a pair of chopsticks to do the job? Again, Chopsticks was the clear winner. Better at managing the food securely, and less potential for damaging non-stick pans. Ariel used a dinglehopper to style her tresses, but women have been known to stick a chopstick in their messy buns to keep them up IRL. Who wore it best? Poor Ariel. But at least she got the prince in the end. Asian style noodles eaten with chopsticks get an assist from the fact that you’re allowed to pick up the bowl. Italian style pasta gets an assist from a spoon to swirl the noodles onto a fork. Which one wins? This is one where I thought the results would be close to 50-50, but three-quarters of you prefer chopsticks over forks for your pasta and noodles. Fork wins, but barely! This was the closest battle of the bunch. Which tool is best for whisking eggs in a bowl? Fork wins this battle, and I have to agree. It seems like I can whisk eggs more efficiently with a fork, but I still grab chopsticks for this job at times. Or maybe people were just feeling sorry for Fork by this point in the survey. Are disposable chopsticks or disposable forks a better item to have in the craft box for when the creative urge hits the kiddos? Hang your head in shame, Fork, and walk out of the arts & crafts room back to the cafeteria where you belong. Somebody forgot the skewers for cooking over the campfire. Do you use a fork or a chopstick to do the job? My kids pointed out that a chopstick is slightly longer than a fork, so it’s safer because your hand would stay just a bit farther away from the flames. Good thinking, kids. Safety first! I honestly thought Fork would have a fighting chance, but it was a pretty crushing defeat. Sorry, Fork. Congratulations, Chopsticks, on your spectacular win!